I’ve always wanted to be bilingual. Western Characters in martial arts movies that also spoke Chinese were an extra measure of cool. Heard about Esperanto, a constructed language intended for diplomacy and global citizenship. VERY unusual, citizen-of-the-world and the exact opposite of life in a small, rural, insular, southern town. Tuck THAT away for future reference. Had the college required 2 years of a foreign language in High School (French was the only one offered. Bonjour et merci!) Despite Mme. Harmon’s patient best efforts, in the end I came away with the three most important sentences in any language: J’ai Perdu, J’ai film, Ou sont la toilette pour la femme s’il vous plait (I’m lost, I’m hungry, where is the ladies room please). Picked up a few words of Mandarin during my Tai Chi days including another very important sentence: ching, wo sang yao Yi chi chow fan…. or something roughly like that. In other words I would like chicken fried rice please. Took a stab at German when Duolingo.com came along, but alas, noun genda rears its intimidating head and this 50 + home girl ain’t playing that again- not yet anyway. I’m still very much just a beginner, but my goal is to learn enough to do at least daily meditation posts in Esperanto … like the the one that follows. Appropriately the Fool card for this little beginning. Why? For the bucket list experience of some degree of being bilingual. Why Esperanto Tarot readings? Because quirky. And global. Because I’m really good at Tarot which increases the easy. 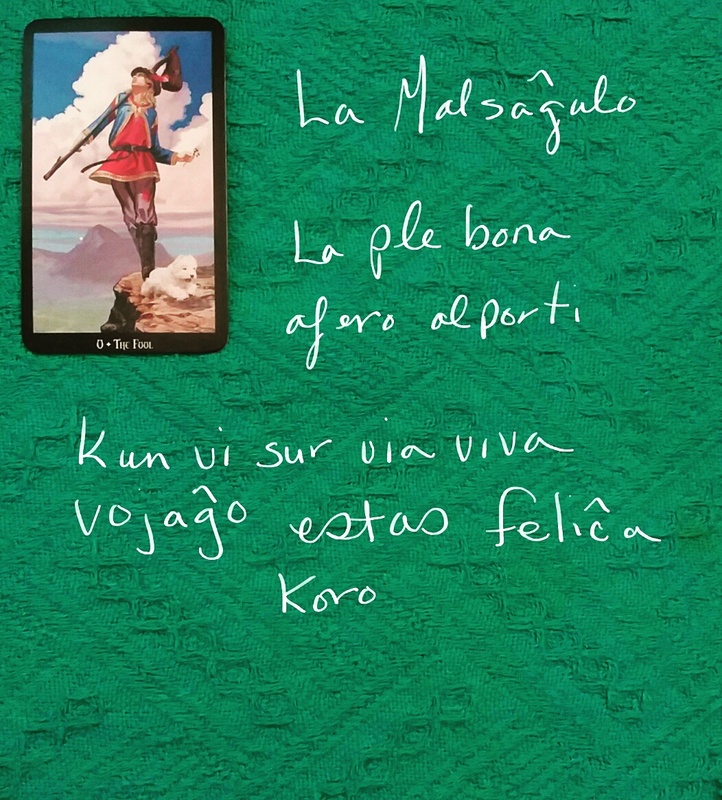 And because how many Esperanto Tarot Readers can there be in the world? Did I mention quirky and global? The Fool: The best thing to bring on your life journey is a happy heart.